Millard Fillmore ( January 7, 1800 – March 8, 1874) was the thirteenth President of the United States, serving from 1850 until 1853, and the last member of the Whig Party to hold that office. He succeeded from the Vice Presidency on the death of President Zachary Taylor, who died of acute gastroenteritis, becoming the second U.S. President to assume the office in this manner. Fillmore was never elected President in his own right; after serving out Taylor's term he was not nominated for the Presidency by the Whigs in the 1852 Presidential election, and in 1856 he again failed to win election as President as the Know Nothing Party candidate. 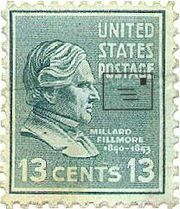 Fillmore was born in poverty to Nathaniel Fillmore and Phoebe Millard Fillmore in Summerhill, New York as the second of nine children and the eldest son. Though a Unitarian in later life, Fillmore was descended from Scottish Presbyterians on his father's side, and English dissenters on his mother's. He was first apprenticed to a fuller to learn the clothmaking trade. He struggled to obtain an education under frontier conditions, attending New Hope Academy for six months. Later, Fillmore bought out his apprenticeship and moved to Buffalo, New York to continue his studies. He was admitted to the bar in 1823 and began his law practice in East Aurora. In 1828, he was elected to the New York Legislature and served from 1829 to 1831. Fillmore was elected as a Whig to the 23rd Congress (1833-1835); he was also elected, to the 25th, 26th and 27th Congresses (1837-1843). He declined to be a candidate for renomination in 1842. He was an unsuccessful candidate for governor of New York in 1844. He was state comptroller of New York from 1848 to 1850. 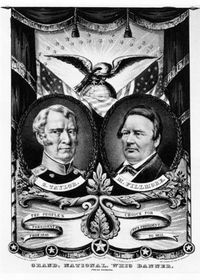 Whig Party banner from 1848 with candidates Zachary Taylor and Millard Fillmore. Fillmore presided over the Senate during the months of nerve-wracking debates over the Compromise of 1850. 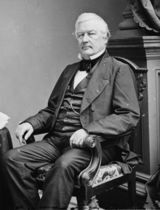 He made no public comment on the merits of the compromise proposals, but a few days before President Taylor's death, Fillmore suggested to the president that, should there be a tie vote on Henry Clay's bill, he would vote in favour of it. Fillmore ascended to the presidency upon the sudden and unexpected death of President Taylor in July 1850. The sudden change in leadership also signaled an abrupt political shift in the administration. Taylor's cabinet resigned and President Fillmore at once appointed Daniel Webster to be Secretary of State, thus proclaiming his alliance with the moderate Whigs who favored the Compromise of 1850. A bill to admit California to the Union still aroused all the violent arguments for and against the extension of slavery without any progress toward settling the major issues. Clay, exhausted, left Washington to recuperate, throwing leadership upon Senator Stephen A. Douglas of Illinois. At this critical juncture, President Fillmore announced his support of the Compromise of 1850. On August 6, 1850, he sent a message to Congress recommending that Texas be paid to abandon her claims to part of New Mexico. This helped shift a critical number of northern Whigs in Congress away from their insistence upon the Wilmot Proviso—the stipulation that all land gained by the Mexican War must be closed to slavery. Each measure obtained a majority, and, by September 20, President Fillmore had signed them into law. Webster wrote, "I can now sleep of nights." Some northern Whigs remained irreconcilable, refusing to forgive Fillmore for having signed the Fugitive Slave Act. They helped deprive him of the Presidential nomination in 1852. Fillmore was one of the founders of the University of Buffalo. The school was chartered by an act of the New York State Legislature on May 11, 1846, and at first was only a medical school . Fillmore was the first Chancellor, a position he maintained while both Vice President and President. 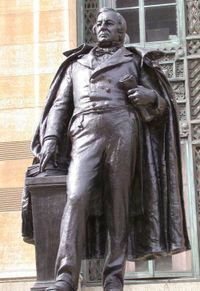 Upon completing his presidency, Fillmore returned to Buffalo, where he continued to serve as chancellor. While touring Europe in 1855, Fillmore was offered an honorary Doctor of Civil Law (D.C.L.) degree by the University of Oxford. Fillmore turned down the honour, explaining that he had neither the "literary nor scientific attainment" to justify the degree. He is also quoted as having explained that he "lacked the benefit of a classical education" and could not, therefore, understand the Latin text of the diploma, then joking that he believed "no man should accept a degree he cannot read." By 1856, Fillmore's Whig Party had ceased to exist, having fallen apart due to dissension over the slavery issue, and especially the Kansas-Nebraska Act of 1854. Fillmore refused to join the new Republican Party, where many former Whigs found refuge. Instead, Fillmore joined the anti-immigrant, anti-Catholic American Party, the political organ of the Know-Nothing movement. He would run in the election of 1856 as their candidate, attempting to win a non-consecutive second term as President (a feat that has been accomplished only once in American politics, by Grover Cleveland). Fillmore finished third, carrying only the state of Maryland and its eight electoral votes, but he won 21.6% of the popular vote, one of the best showings ever by a Presidential third-party candidate. On February 10, 1858, he married a widow Mrs. Caroline Carmichael McIntosh. Throughout the Civil War, he opposed President Lincoln and during Reconstruction supported President Johnson. He commanded a corps of home guards during the Civil War. He died at 11:10 p.m. on March 8, 1874, of the after-effects of a stroke, with his last words alleged to be, upon being fed some soup, "the nourishment is palatable." On January 7 each year, a ceremony is held at his gravesite in the Forest Lawn Cemetery in Buffalo. A bookworm who found the White House devoid of books, Millard Fillmore initiated the White House library. As of 2006, Millard Fillmore remains the last U.S. president who was neither a Democrat nor a Republican (although Abraham Lincoln was re-elected in 1864 running on the Union Ticket instead of Republican, with Democrat Andrew Johnson as his running mate). Fillmore, Utah, located in Millard County, was named after this president. ESPN anchor Neil Everett often makes references to Millard Fillmore while hosting Sportscenter. Fillmore County, Minnesota was named after this president.